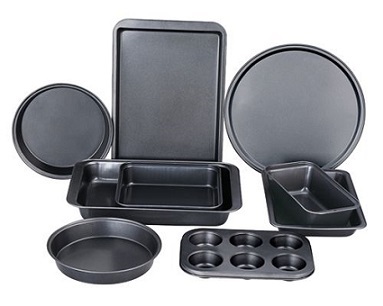 A Bakeware Set is any pieces of bake ware you buy all at once - in a group. Unlike cookware there really are no standard pieces for a bake ware set. The reason is simple. Everyone's baking needs are so different in terms of the type of baking done most often, the materials preferred for baking dishes, and the amounts being baked (pan sizes). 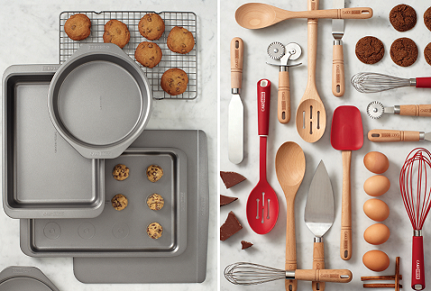 If you don't bake often and you only bake for one or two others, you may find a set that meets all of your needs. But for the rest of us who bake frequently and for larger groups of people, we need to supplement any set with other pans. So what's a person to do since buying a set would probably save money? First decide what kind of material suits you and your budget. A summary of what is readily available is on the main bake ware page. Next identify the most needed pans and in what size or sizes. Then do some online research. I have provided some excellent resources for doing so at the bottom of this page. Check sizes and weights of pans (product specifications) to make certain you are comparing "apples with apples." Are these sets comparable? Not really because the specific pieces are very different, as is the hardness of the nonstick surfaces. Personally, I only buy hard anodized pans if I am going to want a nonstick surface. A friend of mine fell for the cobalt blue. It is a beautiful set but there are many other color choices available as well. Silicone is a versatile bake ware material. It takes temperatures as low as -50 degrees F and as high as 500 degrees F.
It is basically unbreakable. Each piece is coated with a high-gloss nonstick finish, which promotes even browning, resists odors and flavors, and releases baked goods effortlessly. 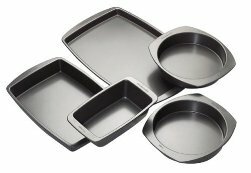 This four-piece silicone bake ware set pictured to the left includes a two muffin pans and two loaf pans with two spatulas. Each piece is dishwasher safe. 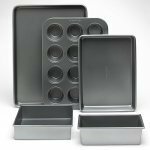 The company who makes my favorite bake ware is now making individual silicone items as well. What is the bake ware I use most often? Stoneware is the best bake ware I have ever had. You can literally bake, slice, serve and store in it. It can be used in the oven, broiler or microwave. It does not absorb odors or flavors. Even heating and heat retention make it a pleasure to bake with these. 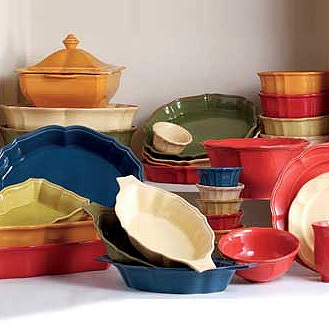 My Le Creuset Stoneware has a durable porcelain-enamel finish that resists chipping, scratching and staining. The company has a wide selection of pieces and colors. I take mine from the oven to the table and serve from them. Of course Le Creuset does not have many of the other items I use for baking like sheet pans, or spring form pans so those come from other sources. Now it's your turn to start exploring! Thank you for visiting. I hope you found this bakeware set information useful. There is much more information to explore on this website. Just click around!